Written specifically for secondary students! 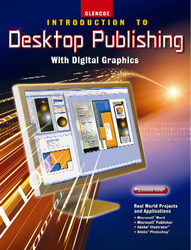 Workshop Foundations introduces each chapter with important basic information regarding desktop publishing skills and good design principles. Before You Read features offer reading strategies and tips. Large screen shots boost student confidence in learning new skills. Eye on Ethics features encourage discussion of important ethical issues.